Last May our fridge started emitting a horrific noise, like a seal in labour. So we got the landlord to send round a guy to fix it. Twice he came with no positive outcome. 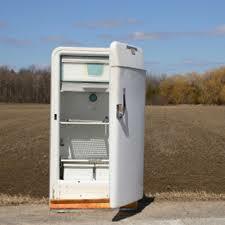 A second, smaller fridge was provided in case of emergency. "Can we just have a new one?" "No, I think we can fix it." Twice more he came. Fiddle fiddle. Nothing doing. We then went on our summer holidays. On our return, still the noise and a leak inside. "Please can we have a new one?" Delay delay delay… Finally: "Yes." Off we went to Best Buy and bought a fridge with delivery arranged for Friday morning. Liz stayed in all day. No fridge forthcoming. Back to the shop the day after. "Sorry, we sent it to the wrong address". "Where is it now?" "In the truck but we can't get to it because the delivery guys don't work weekends. We can deliver Tuesday". Best Buy, Worst Service. Tuesday comes along. They turn up but the lift is out of action. Liz begs then to hang on till the lift is repaired. Finally they bring it up and install. "But you can't use it for 24 hours. It needs to settle." Today, finally, we had a grand switching-on ceremony, food was placed on its pristine shelves, magnets applied to the door. It has a cold water dispenser. Cool.